Find out which stocks hardly helped at all in the Dow's big move. Since August 2010, the Dow Jones Industrials (DJINDICES:^DJI) have risen from below 10,000 to within a fraction of a point of 20,000. Doubling in just over six years is an impressive feat, especially given that the Dow also pays a respectable dividend yield of more than 2% on top of its rise. Yet although all 30 stocks that are currently in the Dow have risen over that period, some haven't done nearly as well as the overall average. In particular, Wal-Mart (NYSE:WMT), IBM (NYSE:IBM), and Caterpillar (NYSE:CAT) have underperformed the Dow since 2010. Let's look more closely at these stocks and whether they can start pulling more of their weight in 2017 and beyond. Wal-Mart hasn't exactly done badly over the past six years, rising 57%. Yet the retail giant has seen several big moves in both directions over that timeframe, and the state of its once-commanding big-box business is far from the colossus that long-term investors became familiar with throughout most of its history. Wal-Mart has faced numerous challenges that it hasn't yet entirely conquered. On one hand, the benefits that Wal-Mart gained during the financial crisis had started to peter out by 2010, and many shoppers started to prefer slightly more upscale retail establishments compared to the famous discount department store. On the other hand, competition from online retailers has only gotten fiercer during the 2010s, and the resulting negative pressure caused same-store sales slumps that lasted for years before finally reversing themselves. More recently, labor cost issues have played a role in holding back profit growth, and efforts to build up its e-commerce presence have met with only mixed success. To play a bigger role in the Dow, Wal-Mart will have to establish that its efforts to revamp stores and offer new services will keep it competitive with its retail peers. IBM has the longest pedigree of Dow membership of these three stocks, having joined the average in 1932. Throughout much of the second half of the 20th century, IBM was a key leader in the technology industry, creating the personal computer and helping to drive its widespread adoption across the globe both for businesses and consumer use. Even when the hardware arena became less specialized and more of a commodity business, IBM adapted by entering the software and services field to tap into higher margins. Yet returns have slowed, with just a 58% gain since late 2010. In recent years, IBM's efforts to reinvent itself have met with greater skepticism. The move toward cloud computing and data analytics has led IBM to make further changes, including its decision to sell off a key server business in 2014. With the company's Watson cognitive-computing system, IBM hopes to find a wide variety of applications for clients to use, ranging from offering better customer service to assisting healthcare professionals with diagnosis and treatment decisions. The key question for IBM is whether it can keep making progress quickly enough to keep up with nimbler competitors. If it can, then the stock's contribution to the Dow's upward movement could become more important in the future. Finally, Caterpillar has been one of the hardest-hit Dow stocks over the past six years. A huge rebound in 2016 brought its total return since late 2010 to nearly 70%, but as recently as early 2016, Caterpillar's performance was flat during the period. The main problem that Caterpillar has faced is an unprecedented confluence of bad industry conditions among its key customers. One by one, poor performance in construction, infrastructure, mining, and energy has conspired to hold Caterpillar back, and customers have been sluggish in replacing aging equipment and boosting capital spending to acquire new products. The prospects for better commodity prices in the future helped push the stock higher over the past year, and health in commodities will be the best opportunity for Caterpillar to keep regaining ground and make a bigger impression on the Dow in the future. Yet if global conditions deteriorate, then Caterpillar could start weighing on the Dow again, as it has throughout much of the past several years. 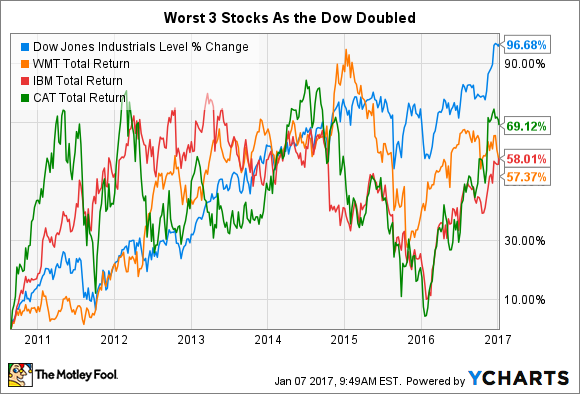 The Dow has done well for investors with its double since 2010, but it's inevitable that not every stock will pull its weight. Looking forward, though, there are things that Caterpillar, IBM, and Wal-Mart can do to try to keep up more effectively with their Dow peers in 2017 and beyond.